I first visited Squamish a little over three years ago; I had spent the last 18 years living on Vancouver Island, all the while believing I would never move off that wonderful rock. Within moments of arriving in Squamish I knew I was meant to spend my life here; in the estuary and in the mountains, climbing, hiking, and pursuing photography. Three weeks later I said goodbye to all my friends, loaded up my belongings and left the island behind. I have always been a dream chaser, running through open doors, seizing opportunities, and diving into the unknown without hesitation. My climbing improved almost as fast as I was making friends, and it didn’t take long before I fell in love with an amazing man. He shared my passion for photography and climbing, and we shared countless adventures, meals, and photo ideas. He was my best friend, who I trusted and opened my heart to more than I had to anyone before. He changed my ideas about religion and family. For the first time ever I thought I would be a mom someday and have my own family with him. I believed we could get through anything together. Depression and suicidal thoughts have plagued me my entire life, as well as several of my family members. Insecurities, miscommunication and my illness took it’s toll on our relationship, adding stress and slowly distracting us from the reasons we fell in love. In time our relationship became abusive; intimidation and verbal wars eventually let to physical attacks as we stubbornly worked against each other. I was ridiculed and harassed for my depression, manipulated and lied to, and worst of all emotionally abandoned at the hardest time in my life. My best friend had turned into the greatest threat to my well being, yet I refused to believe he intended me any harm. I continued to fight to save our future together while he watched me slip off a cliff without so much as a outstretched hand to help. The physical abuse I had been dismissing reached a crescendo one night when my persistence to discuss our relationship pushed him over the edge. The intensity of his attack came as no surprise after the lack of remorse I had previously witnessed. He threatened to hit me if I didn’t leave him alone; I refused to walk away and paid the price. I stood my ground to have a reasonable conversation trying to save our family, and ended up in the hospital. I suffered bruises on my entire body, a split lip, internal bleeding (which has lead to ongoing problems) and a potentially permanent neck injury. He strangled me from behind in a choke hold, fracturing the cartilage in my throat and putting vertebrae in my neck out of alignment. After my initial recovery I tried to help myself heal emotionally with climbing as I always had in the past. In doing so I found myself in intense neck, shoulder and back pain. No longer could I deny the seriousness of my injuries. First I cut out bouldering, then any steep climbing, then anything that really challenged me until I was only able to climb easy slab without days of pain after. I also had to reduce the amount of weight I could carry in a pack, forgetting all together about backpacking. No longer able to head into the alpine, go backpacking, or climb any of my favourite styles, I focused on slab climbing. With the great weather this past spring my slab skills progressed quickly, until one day in May my body once again gave out due to my neck injury and I had to give up climbing all together. While my friends were out climbing I was home in pain, depressed and lost. I desperately missed the mountains, and the pursuit of adventure. I didn’t how I would recover physically or emotionally no longer being able to live the life I came to Squamish for. I dedicated myself to work, physiotherapy, and counselling. I talked to anyone that would listen to try to understand what I had been through, and I sought out new types of photography. My life was slowly turning around. I made new friends and reconnected with old ones while forgetting about the ones that had abandoned me and sided with him. I spent countless hours sitting by the river gazing up at The Chief slowly coming to terms with the chance I may not enjoy climbing again or live without daily pain. The last 6 months have been some of the toughest, yet most rewarding in my life. My eyes have been opened to the scope of domestic violence that exists in our society. I have learned I’m not alone, to have faith in myself and who my real friends are. 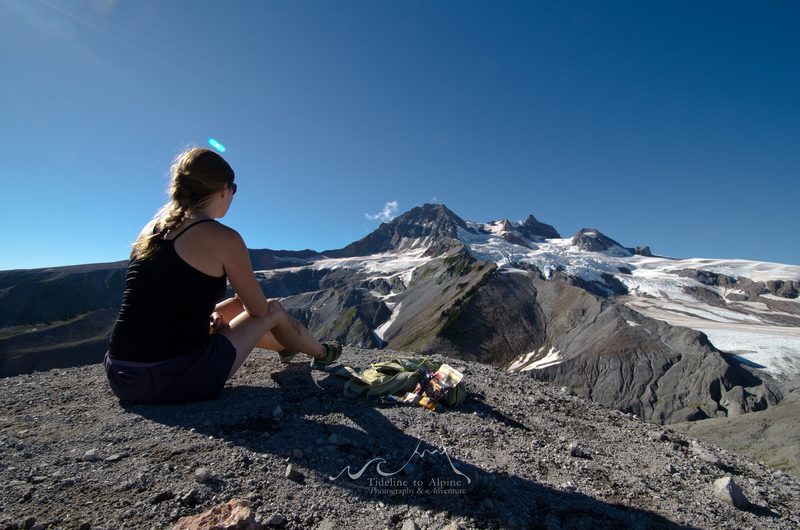 It was hard to let go of climbing and the family I thought I would have, but I refused to give up on the life in Squamish I had dreamed of for myself. In July I adopted an amazing dog I call “Squawesome Frank”. We saved each-others lives. Achieving the best life for both of us meant being extremely active, lots of time outdoors. Determined to not only be in the mountains again, but also to help others through tough times I set myself a seemingly impossible goal. In one year I would go from being a non-runner volunteering for the Arc’teryx Squamish50 to racing the 50 mile course. In late August with Frank as my partner we began running. Our first run was 9 km of easy trail. It felt hard. I doubted myself, and thought I was in over my head. I wanted to give up my crazy idea, but even more I wanted to inspire others so I kept running. After less than two weeks of running I have increased my distance to 36km in the alpine and erased my doubt. No-one deserves to have their dreams taken away due to the actions of others, and I will continue to run through the mountains with my camera to show women everywhere that it always gets better, you are amazing, and you can achieve anything you set you mind to. The next year will be a demanding challenge both physically and emotionally, but no matter what the trail brings it’s my choice. When the trail gets tough, my body starts to hurt or I get tired I remind myself that it will never hurt as much as what I had inflicted upon me. Even if I were to break bones, tear tendons or run till I vomit it will never hurt as much as being targeted by a loved one. The pain of pushing my limits will never be personal. It’s my choice, and the memory of how I was treated brings me strength on the trail. I find peace in running and slowly it is helping to heal my damaged faith. When the road to your dreams is washed out by the actions of others it can be hard to recovery, but there is always a way to make those dreams come true. Through running I’ve found my way back into the mountains, and back to myself. I am in control of my future, my dreams and my happiness; I am not a victim and I will not give up.